A large preliminary aim has been achieved! The Red Sea Governor has agreed to put the Code of Conduct and particular protection zones in the Northern Red Sea of Hurghada, Egypt. These will now be implemented during the summer and will be controlled by rangers of the National Park. The Code of Conduct, which was developed by us in collaboration with the Egyptian authorities and environmental organizations, is based on our research data gathered during recent years. The data was also used to prove that the defined protection zones d are important resting areas for the dolphins. Adherence to the Code of Conduct will be controlled by numerous patrols conducted by the rangers of the National Park. To accompany this, Care for Dolphins together with the National Park will run workshops in August for the Aquacenter and local diving schools. 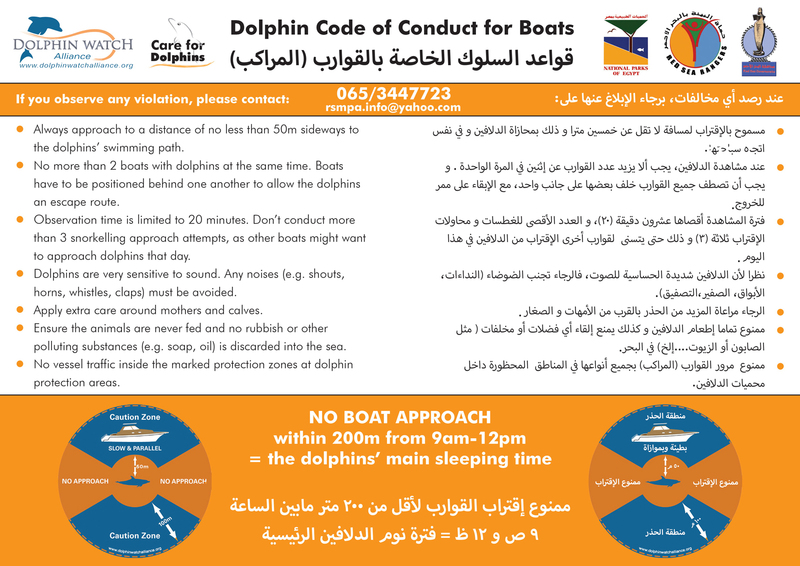 Through “Care for Dolphins” – our local grassroots project – we would like to inform as many tour guides, guides and captains about the new Code of Conduct and also to bring them closer to nature and species conservation. This is why we are running a series of seminars to raise awareness as well as distributing flyers and workshop sheets to inform people. A developed management plan shows the dolphin’s protection zones. During their resting phase from early morning until midday, the dolphins must remain undisturbed by tourist boats. Additional research will continue in order to reveal the effects that these new measures will have on the dolphins.